Kids typically love to give their parents gifts, but they often lack the money needed to buy them, and it can seem silly to spend mom and dad’s money to buy them a gift. Instead of buying a gift, there are many things that kids can make for their parents to give them. As the kids’ nanny, you can help the kids decide what kind of things their parents would like, and then help them turn that idea into a reality. 1. Make a stepping stone. Purchase a stepping stone kit to make this process easier. You will mix your concrete according to package directions, and then fill the mold and allow the concrete to set for 30 to 60 minutes. Add embellishments and the child’s initials to the stone and allow the stepping stone to dry for several days before taking it out of the mold. The kit may come with additional steps to follow. 2. Create a wind chime. 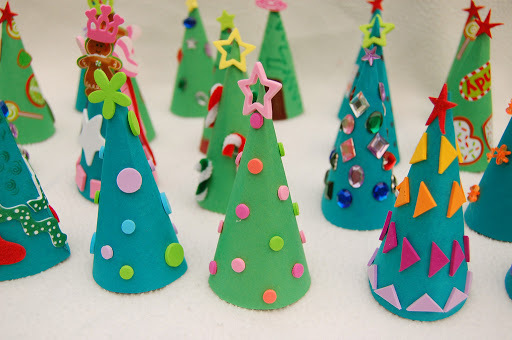 Gather up three large bells, three cupcake papers in different colors, string, hole reinforcement stickers and a sharp needle tool. Punch holes in the middle of the cupcake papers and reinforce the holes with the adhesive stickers. Cut the string into 8 inch, 10 inch and 12 inch lengths. Tie one end of the string to the bell and thread the other end through the hole in the middle of the cupcake paper. Repeat with the other strings. Draw the bell up under the cupcake paper so the bell is hidden, then tie the strings together at the end. The wind chime is complete. 3. Draw a self-portrait. Take a picture of each child and print it out on the computer as an 8×10. Set the kids up with colored pencils, paper and the photo and have them draw themselves. After the drawing is done mount it in a frame. 4. Create a book. Bring together a bunch of pictures of the kids, as well as pictures of the kids’ artwork. Ask the kids to give a brief description for each photo. Load the pictures and the stories online and order a bound book. Before the kids give the book to their parents, make sure that they write a nice sentiment in the front of the book for their parents. 5. Make a hand plaque. Buy a kit for making handprint plaques. Most kits will be for toddlers and below. For bigger children you may have to create your own mold by using plaster of Paris and a plastic plant drainage dish. Follow the directions in the kit to mix the plaster and to make the hand print. Make sure to write the child’s name and the year. 6. Paint a platter using footprints. Look around for a ceramics store that will help the kids put their painted footprint or handprint on a platter or other plate. You can then create an animal out of the footprints or ask for help at the store. The kids can also paint their own cups or animals and have them fired at the same time as the platter. All of the painted creations can be labeled and given as one big gift or as separate smaller gifts. 7. Put together a photo mug and cookies. Buy the kind of mug where the rim comes off and you can insert your own pictures or artwork inside the lining of the cup. Cut a piece of paper to the right size and have the kids decorate the paper and then insert it into the mug liner. Then involve the kids in baking some small cookies to fill the cup with. Wrap the whole gift in cellophane and tie it with a bow. 8. Fill an artwork decorated tin. Use a product called waterslide clear decals. Scan in the artwork you would like to place on the tin. Print out the artwork using a laser printer onto the clear decal. Follow the manufacturer’s instructions to mount the decal onto the tin. Once the tin is decorated you can fill it with homemade goodies the kids have helped you make. 9. Draw a checkbook cover. Buy an inexpensive checkbook cover and remove the paper inside of the clear cover. Use the removed paper as a guide when you cut some card stock. Let the kids decorate the front and back panels of the checkbook cover. Replace the card stock in the clear cover and your custom checkbook cover is complete. 10. Make a photo calendar. Many sites on the Internet will allow you to upload photos to make a customized calendar. You can either let the kids pick out photos that they want to use or you can take pictures of their artwork and upload those pictures. Many times you can choose three to four photos for each calendar month. If you don’t have time to wait for mail order, you can go to one of the many copy centers and have them help you do it in house. Mom and Dad will surely love anything that their kids give them, but as the nanny you can help make those gifts useful and personalized for the recipient. Most parents love their children’s artwork, and there are many ways to incorporate artwork into useful items. Tap into the imaginations of the kids and help them create something wonderful this year. Great ideas and I question why "anonymous" above thinks we would have to spend the parents money on the gifts? The nanny can pay and it can be their gift to the parents for the holidays.